you will hold on to less & less. fade like a dream that slowly dissolves particle by particle. Fearlessly you come to experience….. The word detachment holds an interesting meaning beneath our daily use of it, often hidden from us until we actually experience it’s state of being. Just think of the many ways we think we can detach from loneliness, outcomes, suffering, illness, boredom, hurtful words & actions, even death. But ask yourself, where do you think those memories & feeling’s are stored? What does it mean to really detach from an event or a belief? 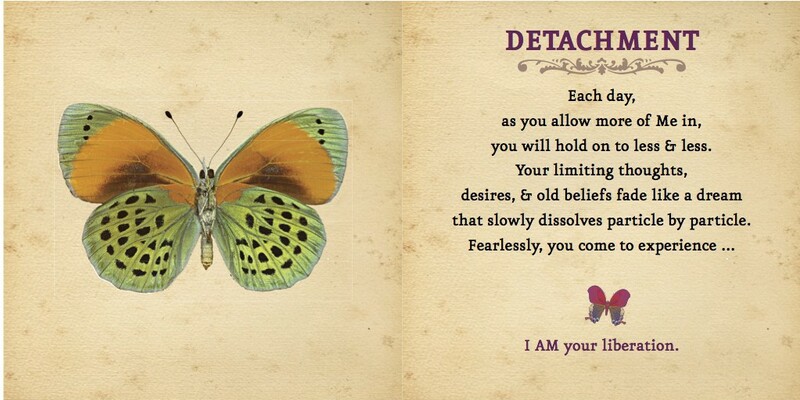 And what magnificent action follows the state of being ‘detached’? This entry was posted in Emerging Soul Cards and tagged Detachment, letting go of old beliefs, liberation, limiting thoughts on March 19, 2015 by Rebecca Winters Rodriguez.